Water markets can help provide a solution to Uganda’s looming water crisis – but only if buyers understand the stakes and the dynamics. Alice Ruhweza, East and Southern Africa Katoomba Group Coordinator, says Ugandan water users understand the crisis but haven’t yet explored market-based solutions. The Ecosystem Marketplace summarizes her findings. 18 April 2008 | Massive Lake Victoria spreads thinly over nearly 70,000 square kilometers in Africa’s Rift Valley, covering more surface area than any other tropical lake in the world. Millions of people and thousands of businesses in three nations depend on this vast but shallow body of water for survival – but huge parts of the lake are themselves “dead zones”, devoid of oxygen and barely capable of supporting what little life remains below the waves, let alone supporting humans on the shore. Key among these humans on the shore are Ugandan brewers, bottlers, flower exporters, electric companies, and of course municipal water plants – all of which are not only dependent on clean water, but also have the economic and political clout to promote change. But do they understand the importance of ecosystem services to their business, and are they willing to put their money where their menace is and support efforts to clean up the water? These were the key questions the East and Southern Africa Katoomba Group put to more than fifteen leaders of Ugandan industry in a survey conducted last year, the results of which have been published in Assessing the Market: Conversations with Private Sector Businesses About Payments for Ecosystem Services – A Letter from Uganda. The answers are, in a nutshell: yes, they are aware of their dependence on this fragile resource, but no, they do not have concrete plans to invest in the lake’s future. These findings were echoed in a survey of Fortune 1000 executives carried out by the Marsh Center for Risk Insights. Forty percent of the companies surveyed said the impact of a water shortage would be severe or even catastrophic, but less than one-in-five (17%) say they have prepared for such a crisis. All companies surveyed named water as the resource most critical to their business, and most of them draw their water from Lake Victoria. Those that aren’t directly dependent on the lake, such as some district or municipal water companies and flower exporters, draw their water from aquifers through the use of boreholes. Some companies also mentioned shallow wells and rainwater collection. Energy or electricity came second on the list, but it is also directly tied to water and hydro-power. 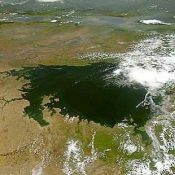 Despite its massive surface area, Lake Victoria has a mean depth of just 40 meters (131 feet), leaving it susceptible to both climate change and conventional pollution. Indeed, inflows of farm run-off and untreated effluent have led to fish die-offs, algal blooms and the spread of water hyacinth (a waterweed), which in turn depletes dissolved oxygen, blocks sunlight, and impedes water transport. A recent survey by environmental engineering group Air Water Earth (AWE) concluded that Murchison Bay, where the Ugandan capital Kampala is located, has only about half the dissolved oxygen needed to support most species of fish; while all along the Lake Victoria shoreline, hyacinth provides habitat for malaria mosquitoes and snails which harbor bilharzia parasites. The key drivers are easy to identify, but that doesn’t mean they will be easy to reverse. Kampala’s sewer system, for example, captures just ten percent of the city’s waste, and most of Lake Victoria’s pollution flows in from nonpoint sources that are almost completely unregulated – such as small-scale workshops, parking lots, and car repair garages. Furthermore, guesthouses, slum dwellings and industries discharge untreated wastewater directly into the Nakivubo Channel, an artificial stream that drains Kampala and its suburbs. The channel flows directly into Murchison Bay, and is responsible for roughly 75% of the nitrogen and 85% of the phosphorus discharged daily into the bay daily, and these nutrients are largely responsible for the eutrophication and algal blooms that clog water treatment plants and extract oxygen from water. Uganda’s National Water & Sewerage Corporation (NWSC) says that the worse the water gets, the more expensive it becomes to make it drinkable. Ironically, NWSC’s own sewage treatment plant at Bugolobi discharges 15,000 cubic meters of inadequately treated sewage per day into Murchison Bay, and has been named the lake’s single largest polluter. The Nakivubo Wetland and other major catchment wetlands, which once played the vital role of filtering effluent and storm water discharging into the lake, have long ago been encroached and degraded by settlement and cultivation. Widespread lakeshore cultivation and soil erosion also contribute excessive sediment and nutrients into the lake. Storm water flowing through Nakivubo Channel now carries tons of soil and waste straight into the lake. All companies surveyed cited climate change as a serious threat, as lower levels of water not only leave more concentrated pollution, but also leave a loss of other services that water bodies provide. The flower exporters and the district water supplier, for example, said they fear canals drying up during ever more-frequent periods of prolonged drought. The lake also acts as a reservoir for hydropower, and falling water levels have reduced water available for generation. This situation is becoming an issue for businesses, because diesel-generated power is expensive and electricity tariffs have increased recently. Already, some companies require water use permits from the Directorate of Water Development which now have even more strict approval conditions to use water. Further compounding expenses, severe power outages in 2005 resulted in business disruptions. For example, exporters of cut flowers exporters failed to meet their customer orders, and Uganda’s overall revenue from flower exports dropped from US$ 24 million in 2005 to US$ 20 million in 2006. Good electricity poles are also in short supply in Uganda, due to deforestation. Therefore, at present, most poles are imported from South Africa at a cost of roughly 1,200,000 Ugandan shillings (approximately US$ 750) each. Recently, the Parliamentary Committee on Natural Resources raised concerns about these costs and asked Uganda Electricity Distribution Company (UEDCL) to find a solution. Furthermore, due to land shortage from high population growth, no land will be allocated for growth of wood for poles and the shortage will continue. Eucalyptus poles have high nutrient and water demand, and are not a sustainable option. PES approaches that could rectify this situation need to be explored. For example, a group of land owners could be given an incentive to plant fast-growing native trees. Most of the companies surveyed have made investments to respond to ecosystem changes, but these are focused on meeting their own, individual, needs – and do not address macroenvironmental issues. Beverage manufacturers, for example, have built water reservoirs on their plants which store water for up to two days. They also recycle 80% of the water that they use, and maintain water treatment plants and waste treatment plants. In the future, many plan to minimize water usage by modifying technology. Flower companies have supplemented the water shortages by drilling bore holes, constructing water collection reservoirs for rain water harvesting, and planting trees. The district water system is advising communities to form water user committees to be proactive in address soil erosion threats by planting grass, and digging terraces in gardens. Some of the companies also have a policy of training employees in safety and environmental management, but implementation is costly and policies are often not implemented. Surprisingly, the electricity sector has not yet articulated a strategy to deal with various environmental service shortages, especially related to water, although the Ministry of Energy is promoting other sustainable alternative sources of energy such as mini-hydropower generation on small rivers, solar power, wind power, biomass energy, and biogas. In addition, most companies are engaged in some form of public outreach, detailed in the full report. All companies said it was critical for natural resources management to be integrated into the company strategies. This would enable market-based mechanisms to be part of the company programs. The easiest way to incentivize this is to begin charging for water, the delivery of which is currently supported through very low tariffs. This approach, however, would likely face stiff resistance from water users, many of whom assert that natural resources are free and should not be paid for. The Payment for Watershed services (PWS) concept exists in Uganda, but has not been incorporated into the present models of water management. Based on the survey and roundtable discussions, payments for water to also cover the cost of maintaining and restoring watershed services would constitute a general shift in company policy. Until now, the companies have emphasized on-site investments to cater for future water shortages and to ensure water quality. PWS would shift them towards the protection and maintenance of ecosystems that provide the water that they use and ideally an eventual recovery of costs. For a payment scheme to succeed and endure, the actions and change brought about by upstream land and water managers should result in identifiable benefits for downstream water users. Therefore, clear cause-and-effect relationships between upstream land and water use practices and the provision of watershed services for downstream users needs to be identified. The degree to which this is possible varies considerably from case to case. There is, therefore, a need for more site specific analysis in order to determine whether a particular site is feasible for PWS. Why Take a Market-Based Approach? Those who own or manage upper watershed land often have little incentive to provide watershed services because the benefits occur downstream, so upper watershed actors don’t receive compensation for providing them. Development of incentives for appropriate land use practices therefore require finding ways for upstream landholders to be compensated for their costs. This is where a more broad-based Payments for Ecosystem Services (PES) scheme could help alleviate the problem. Paying land owners in the upper water catchment to maintain existing forest cover or vegetation, for example, could maintain stable stream flows and reduce sedimentation. Likewise, a small fee could be added to the monthly water bill, with the funds being set aside for conservation and watershed protection projects. Based on our conversations, we have mapped out a three-phase approach that would have to be carried out with the cooperation of private, public, and community stakeholders. Phase 1: Exploring the potential for—and returns on investment related to—payments for watershed services in key areas of Uganda relevant to business, which would include identifying and locating specific areas within targeted watersheds that contribute the most to the water problem (such as water shortages or poor water quality). These studies would also indicate where and how land-use changes must be introduced in order to reduce and eventually eradicate the sources of such problem. Phase 2: Designing a pilot PES project for private-sector investment. Based on Phase I findings, a pilot test of changed watershed management practices can be designed for private sector investment and collaborative implementation and study. Such a pilot would include a cooperation agreement (or memorandum of understanding) between upland watershed service providers and downstream service users (the companies/businesses), whereby the upland providers would agree to carry out certain activities to ensure water quantity and quality in return for an agreed amount of money or form of compensation. Monitoring and verification can be undertaken by a third party. Phase 3: Implementing a pilot PWS project (or portfolio of projects) and assessing results, including return on investment (ROI). The last stage would be implementation of the agreement for an agreed period of time (with continuous monitoring) that would enable private sector partners to assess if payments for watershed services offers improved reliability of water quantity, quality and/or cost savings. Alice Ruhweza is Coordinator of the East & Southern Africa Katoomba Group. She can be reached at aruhweza@hotmail.com.